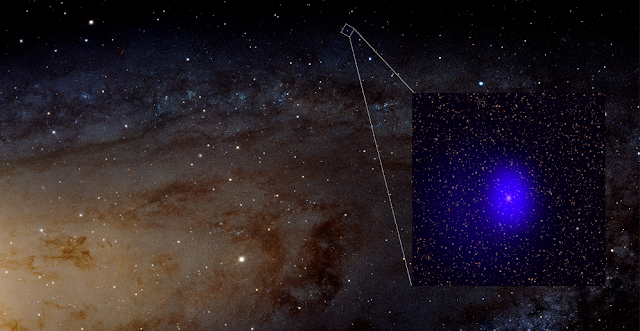 Gemini observations played a critical role in research by scientists at the University of Washington in their quest to identify an object which appears to be “photobombing” the Andromeda Galaxy. The researchers determined that rather than being a binary star system within the neighboring Andromeda Galaxy, as previously thought, the object is really a distant galaxy containing a supermassive black hole binary – a pair of black holes orbiting each other very closely within the galaxy’s core. Observations by NASA’s Chandra X-ray Observatory first cast suspicion that things weren’t as simple as they appeared due to the intensity of the X-ray source. The results are published in the November 20th issue of The Astrophysical Journal and described in the press release that follows from Chandra/NASA. Gemini Observatory is funded through an international partnership led by the U.S. National Science Foundation (NSF), with contributions from the Canadian National Research Council (NRC), the Argentinean Ministerio de Ciencia, Tecnología e Innovación Productiva, the Brazilian Ministério da Ciência, Tecnologia e Inovação and the Chilean Comisión Nacional de Investigación Científica y Tecnológica (CONICYT). It seems like even black holes can’t resist the temptation to insert themselves unannounced into photographs. A cosmic photobomb found as a background object in images of the nearby Andromeda galaxy has revealed what could be the most tightly separated pair of supermassive black holes ever seen. Astronomers made this remarkable discovery using X-ray data from NASA’s Chandra X-ray Observatory and optical data from ground-based telescopes, Gemini-North in Hawaii and the Palomar Transient Factory in California.